Identifying and analysing the key trends and the legal issues that need to be resolved to support the further development of international trade. This paper is divided into two parts. The first part considers some of the main global trends that are shaping the current landscape in international trade. Central to this is the rapid economic development of the BRICS (Brazil, Russia, India, China and South Africa) and MINT (Mexico, Indonesia, Nigeria and Turkey) countries. As living standards increase, the demand for raw materials and consumer goods necessitates that the volume of imported and exported goods into and out of the BRICS and MINT countries will increase. Recent experience suggests, however, that the path to full development will be far from straightforward. The paper then goes on to consider some of the challenges to economic growth. The sustained period of economic uncertainty and stagnation amongst developed nations appears to be impeding the growth rates of emerging markets (EM). Nevertheless, the pattern of international trade has been permanently changed by the growth of these countries. The second part of the paper considers the laws that are relevant to international trade and the way in which these laws have assisted the development of trade, but also what is required to develop them in order to deal with the changing environment in international trade. By virtue of its very nature, international trade requires there to be laws and regulations that will be recognised in multiple jurisdictions. This has given rise to the proliferation of international bodies established in order to promote, govern and regulate certain aspects of international trade on a global basis, such as the United Nations Commission on International Trade Law (UNCITRAL), the International Chamber of Commerce (ICC) and the International Maritime Organisation (IMO). In addition there needs to be a law that governs the relationships between parties, so that parties engaging in trade can have certainty about the enforcement of their rights and obligations. The challenge of choosing that law and enforcing it is a key challenge for the future growth of international trade as trading patterns change rapidly, an issue which this paper will consider, alongside recent developments aimed at furthering international trade law on a global basis, including bilateral investment treaties (BITs), reciprocal enforcement of judgments and the harmonisation of laws. For much of the past three decades global growth has been driven by the expansion of EMs – in particular the BRICS economies. Since 2000, EMs have accounted for more than half of global GDP growth as the BRICS have routinely recorded double-digit growth figures and by 2013 EM economies accounted for more than half of global GDP on the basis of purchasing power1. Rapid economic expansion has not been confined to the BRICS, and other EMs have started to emerge as drivers of global growth, including the MINT economies. Indeed, much recent commentary has compared slowing growth in the BRICS with the situation in other EMs. In 2015 Brazil, Russia and China all look set to experience lower growth than in recent years2, even as the expansion of EMs as a whole gathers momentum. Looking to the future, it has been argued that factors ranging from demography to geography will see more rapid growth rates in EMs that do not belong to the BRICS club, in particular the MINTs. For instance, the World Bank has estimated that by 2050 Indonesia’s GDP will be almost seven times its size in 2012, whilst Nigeria’s GDP will be almost nineteen times as big3. There is no one explanation for the slowing growth in some of the BRICS economies, and to an extent each is confronting a specific combination of issues. In China, a growing debt bubble is causing concern both domestically and internationally, whilst Brazil has been hit by falling commodity prices and a failure to invest in productivity improvements during the boom years. Meanwhile, Russia is set to experience recession after the effects of plummeting oil and gas prices have been exacerbated by the imposition of Western sanctions. Both Russia and Brazil also have serious problems regarding the competitiveness of their private sectors. However, whilst there is a widespread belief that the era of double-digit BRICS growth is over, their role in the global economy, both present and future, should not be downplayed. For a start, India has recently upgraded its GDP growth forecast for the 2014 financial year from 4.7% to 6.9%4. Moreover, despite the weaknesses of particular BRICS, the size of their combined economies is set to exceed that of the US economy by the end of 20155. Over the next three to four years each of the BRICS predicts continued economic growth, with India expecting year-on-year growth to rise to between 7% and 8% between 2016 and 20186. Despite the significant problems many foresee for the BRICS economies, others have been encouraged by the willingness of the administrations in the two most populous – China and India – to confront these issues with practical and effective policy decisions. This growth is still very significant when compared with the old world economies. The BRICS grouping is also becoming increasingly assertive on the international financial scene. In July 2014 they founded the New Development Bank, or ‘BRICS Bank’, which has been seen as a potential challenge to the hegemony of the US-led post-Bretton Woods global financial and monetary system. Other evidence points to a growing perception that the continued growth of the BRICS and other EMs will continue to alter radically the structure of the global economy. Even if the pace of EM growth does not return to the levels reached in the previous decade, it is inevitable that the size and importance of EM economies will grow, as will the assertiveness and confidence of the governments overseeing these economies. International trade will be a significant part of this growth. Even as China looks to stimulate domestic demand and to reduce its reliance on exporting goods, it will remain an important international trade player. Meanwhile, India’s recently-elected government, is looking to stimulate its trade with major international partners from the USA7 to Japan8 whilst Turkey has identified diversifying its exports as a major economic objective9. Exports are also a key driver of Mexican economic performance, and should continue to expand if economic growth in the United States is sustained and if the Mexican government persists with its economic and political reform agenda. In the coming years, the growth of trade between EMs will far outstrip the increase in trade between advanced economies, radically re-shaping international trade routes. The type of goods being traded will also transform as EMs move away from a reliance upon exporting basic commodities and start to produce more refined goods, chemicals and pharmaceuticals, amongst other things. Between now and 2030, huge growth will be seen in trade linkages between regions which bypass the developed economies of North America and Europe – in particular trade between South America and the Asia-Pacific region10. Clearly, the coming years will, if anything, see an acceleration of the rise of EMs and their role in the global economy. Future drivers of economic expansion will be diverse and will differ between economies, as each derives growth from a variety of sources. Below are examples of the predicted future trends in three of the largest regions in international trade, namely China, the Unites States of America and the European Union. Chinese economic policy will continue to focus on boosting domestic demand and consumption, as policymakers look to enact a shift away from reliance on export-led growth. As the Chinese economy develops and affluence increases, consumption patterns will progressively resemble those of developed economies. The rise in year-on-year retail sales has been steady over recent years, with growth becoming increasingly strong in the market for higher-end goods and food as consumption patterns adapt to the population’s increasing wealth11. The Chinese government estimates that investment in fixed assets is particularly important to keeping growth rates stable12. Investment levels are dipping (notably in the manufacturing and construction sectors), which is seen as a significant cause of the recent economic slowdown13. Despite stimulus measures (including an interest rate cut) imports in January 2015 were down 20% when compared with the same period in 201414. Imports of crude oil and coal also saw marked falls at the beginning of 201515. Such trends have wider regional and global effects, particularly as they are factors in pushing down global commodities prices. This will be discussed in the next chapter. However, in the long-term, Chinese growth will remain high by global standards. There are reasons to see the recent slowdown as a blip, even if it does signal the start of a less intense period of growth (in percentage terms) than over the last few decades. The average annual growth rate in China over the last 30 years exceeded 10%16, and even if rates remain at the current rate of 7% to 8% that, on any view, will amount to very significant growth over the coming years. Further encouragement can be derived from the re-balancing of the economy. In the past there were fears that the economy was over-reliant on (often inefficient) investment and that consumption was too weak. By contrast, recently the relative proportions of investment and consumption appear to have found a more sustainable equilibrium. The investment-to-GDP ratio has dropped, whilst consumption accounts for a steadily rising proportion of growth18. Employment and wages are also rising, which will further boost consumer activity19. GDP growth rates will be between 7% and 8% in 2015 and 2016, far outstripping the OECD average20. According to a survey by PwC, between 2011 and 2050 Chinese GDP, both in terms of purchasing power parity and per capita, will grow at an average rate of over 4% per annum – becoming the world’s largest economy21. Of the countries surveyed, only Nigeria, Vietnam, Indonesia, India and Malaysia would enjoy faster-paced growth22. Continued economic growth, added to population expansion, will see imports rise significantly in the medium- to long-term. It is predicted that China’s expanding and wealthier population will drive imports of an increasing range and quantity of foodstuffs, as well as high-specification transport-related and industrial goods23. Exports will also continue to grow (at an annual average of 10% to 2030), especially those to EMs in Asia, the Middle East and North Africa. A rising proportion will be IT and industrial goods, although sectors like clothing will remain strong24. In contrast to most developed economies, the USA has recently enjoyed rapid growth which is expected to last into the foreseeable future. Job creation is healthy and falling prices are boosting consumption. Investment is also high. In the next few years the US government expects economic growth to remain strong, inflation to remain steady and low, and unemployment to continue to fall25. Whilst weakness in the eurozone and several commodity-exporting EMs could slow this growth and dampen exports, growing domestic demand and a strong dollar should encourage imports. Whilst a strong dollar could have an adverse impact on large multinationals with significant non-US revenue streams, on the whole the outlook is positive for both consumers and the majority of American companies. Cheaper oil, cheaper imported goods and continued low inflation all herald optimism for an economy that is powered by consumer spending26. The long-term outlook is good – and whilst it appears that China will shortly overtake the USA to become the world’s largest economy, American GDP is still expected to expand consistently and to roughly double in size by 2050, growing to US$30-40 trillion27. The eurozone’s troubles continue and recent political events have prompted fears that the currency bloc could see a return to the turbulence experienced at the height of the crisis in 2010-2012. Economic weakness in Europe has a clear knock-on effect in EMs, in that weak demand hurts exports in economies from Turkey to the Far East28. However, the long-term predictions still forecast steady GDP growth in the main developed European economies (principally the UK, France and Germany)29. Even in the short term, the EU and European Central Bank have revised up their forecasts for 2015 and 2016 and for the first time in 8 years all EU Member States are expected to record positive growth figures30. Eurozone GDP figures for the last quarter of 2014 also beat expectations – in several countries investment was strong, the low oil price boosted domestic consumption and the weak euro prompted increased exports31. As long as the euro remains weak, trade will remain a central plank of several governments’ growth strategy – Italy, for example, is relying on growing exports to leave recession32. In addition, economic confidence in several central and eastern European countries – primarily Poland, Hungary and the Czech Republic – is high33, notwithstanding geopolitical uncertainty caused by European tensions with Russia. Even if European performance does disappoint, this should be off-set by continued EM economic growth which, as has been seen, looks positive in the medium and long-term. In particular, Indian economic performance is exceeding expectations and across EMs several key indicators – including the Purchasing Managers’ Index (PMI) – show that there is a good deal of confidence in future economic performance34. Whilst there may be several reasons for optimism in the medium and long-term, the general outlook for global growth in the short-term appears to be more pessimistic. This is most likely due to a combination of factors which together are causing instability and a lack of confidence in the recovery from the global financial crisis. Perhaps the greatest cause for concern in the context of international trade is the apparent slowdown in the growth rate of the Chinese economy, which last year expanded at its slowest rate in over twenty years. Although the latest official figures indicate that the growth rate has stabilised at 7.3% per annum, there are other indicators that suggest that the position is less secure. Of particular relevance to international trade, a recent survey published by the Customs Administration indicates that in January 2015 the Chinese monthly trade surplus grew to a record US $60 billion. Against the figures for the same period in 2014, imports fell by 3.3.% and exports by 19.9%. Both these figures were worse than expected by analysts. It is reported that the main reason behind the reduction in exports was the slow down in the manufacturing sector, which contracted for the first time in two years. These figures have two main knock-on effects for international trade. First, as the largest manufacturing nation in the world, China’s figures are often seen not in isolation but as an indicator of the general health of the world economy. Therefore, if Chinese manufacturing and exports are declining, there is a presumption made that global demand for manufactured goods is also declining. This in turn may indicate that the health of the global economy is less strong than previously thought. Secondly, if Chinese imports are falling, China is buying a reduced number of goods from other countries, with the consequence that the exports of the rest of the world will be reduced and their growth rates similarly affected. Against this backdrop, investors are often deterred from capital spending in international trade, an issue which can exacerbate the problem further. This over-supply has been caused in large part by a refusal of the major producers to reduce their production levels in response to the fall in demand. For example, following their annual meeting in Vienna in November 2014, OPEC announced that it would not cut crude oil production, despite the price crash described above. It is widely reported that the basis for this decision was that the largest and most influential member of OPEC, Saudi Arabia, did not want to risk sacrificing its market share in light of the boom in shale oil production. Similarly, four of the largest iron ore producers, BHP Billiton, Rio Tinto, Anglo-American and Fortescue Metals, have openly pursued a strategy of flooding the market with tonnage to drive the price down with the reported intention of forcing less efficient producers out of the market, thereby eventually leading to a reduction in supply. The strategy is not without risk as a large number of the less efficient producers targeted by the “big-four” are either state or state-backed entities, and are therefore not as vulnerable to market fundamentals as private companies. Whether this emphasis on taking short-term pain to maintain market share will be successful or indeed sustainable remains to be seen. However, the consequences will be far reaching in terms of how commodities markets respond to over-supply in the future. In the more immediate term, the sudden and marked fall in commodities prices is having a significant impact on the global economy. Whilst countries that are net consumers of commodities are welcoming the reduced costs, producing nations (for example many of the African and South American nations) that are heavily reliant on the income generated by commodities are faced with the prospect of significant budget deficits. It is conceivable that this may in turn lead to increased borrowing, higher taxes and, in the worst case scenario, political instability. In regard to market participants in commodities, such as the oil majors and large traders, the response to date has been to cut capital spending and bring forward divestment from unprofitable assets. It may also be necessary for producers to consider new ways of raising finance, such as through private equity, pre-payment off-take agreements or the issuing of convertible bonds. A further cause for concern in the development of international trade is the significant ongoing geopolitical tensions in Ukraine/Russia and Syria, Iran and Iraq. International trade relies on the free movement of goods and services in and out of different jurisdictions. Geopolitical tensions therefore impede international trade both in a practical sense, as political turmoil and violence severely limit the physical movement of goods, and in a legal sense, as sanctions put in place by the European Union and the United States of America in particular, have restricted the types of trade permitted with these nations. In the case of Russia, the sanctions have been met in kind with the imposition of restrictions on the import of certain food types from western countries. Again, it remains to be seen what the long-term impact will be on international trade as a result of these conflicts. Political instability within a country is also a recent factor impacting on international trade. Piracy has been a recent problem off the east coast of Africa, and has recently re-emerged off the coast of west Africa. Whilst the international community has worked together to resolve the issues in east Africa (with the use of convoys, navy patrols, and armed guards), this was an issue which significantly impacted international trade at the time. The shipping industry, one of the central components in international trade has been subject to significant turbulence since the global financial crisis. Freight rates have plummeted as global demand for commodities, especially in China, has fallen. In February 2015, rates on the Baltic Dry Index reached their lowest ever level37. The rates for bulk commodity carrying ships could remain at these historically low levels if Chinese steel output and coal demand remains low. Most analysts do not predict an upturn in rates in the immediate future, with the most optimistic predictions not foreseeing a rebound until the second half of 201538. A major cause of the drop in rates has been over-capacity on many shipping lines, exacerbated by the slowing of trade growth since its 2008 peak. Some have said that freight rates could even decline in the next few years as year-on-year trade growth is unlikely to attain its pre-2008 levels in the foreseeable future39. Beyond this near-term view, in the longer term patterns of global trade are likely to alter radically. As demand remains weak in advanced economies but continues to expand in EMs, the volume of intra-EM trade will constitute an increasingly important proportion of total global trade flows40. Currently under-utilised trade routes will grow in prominence – for example, that between Argentina and India41. China’s dominance of international trade will grow, and by 2030 it will feature in 17 of the top 25 bilateral sea and air freight routes42. Between 2009 and 2030 the countries featuring in this ‘top 25’ will change noticeably, and several countries not featuring at all in 2009 will be listed by 2030 (including Indonesia, Malaysia, Nigeria, Thailand, Saudi Arabia, India and the UAE)43. Despite these drastic shifts, several established trade routes will remain amongst the most-used in global trade. For the foreseeable future, China will remain Brazil’s main export destination, whilst Canada, Mexico and China will remain the USA’s biggest export partners44. Other established bilateral trading relationships which will remain amongst the world’s largest include those between Japan and China and Japan and the USA, as well as the USA’s strong trade relationships with European countries like Germany and the UK45. Added to this, new shipping routes could also impact upon international trade flow – in particular, the Northern Sea Route (NSR), which follows Russia’s northern Arctic coastline. As Arctic sea ice melts, it is becoming increasingly possible for large vessels to sail in ever quicker times from Europe to Asia. Via the NSR, the sailing time from Rotterdam to Kobe or Busan could be reduced by almost a third when compared with the traditional route travelling through the Suez Canal46. The tonnage sailing via the NSR is growing rapidly – in 2010, just 4 vessels made the voyage. By 2012 this had increased to 46, and in 2013 the number of transit permits issued by the Russian authorities was 8 times this number47. South Korea’s Maritime Institute estimates that the NSR could account for 25% of all trade between Asia and Europe by 203048. A combination of factors, from accelerating climate change to heightened geopolitical tension in the South China Sea to piracy could see the NSR become an increasingly viable and popular choice for vessels carrying goods between Asia and Europe. There has even been a suggestion that melting ice could open up the Northwest Passage (passing over Canada and Alaska) to more large commercial vessels, which could also save tens of thousands of dollars in fuel costs49. Even though this is widely seen as having less commercial potential than the NSR, it is a further illustration of how factors ranging from climate change to economic development will rapidly alter global trading patterns in the future. The growth of e-commerce is a further factor that will drive the development of international trade patterns and relationships over the coming years. Over the last two decades, the huge growth of e-commerce platforms like eBay and Amazon has changed the way many consumers access domestic and international markets for a range of goods. This trend looks set to continue as new companies, especially in emerging markets (notably, Alibaba) continue to grow and expand. The nature of e-commerce itself will also transform, especially with the growth of commerce conducted on mobile phones and other portable devices (so called “m-commerce”). The Chinese e-commerce market is forecast to undergo substantial growth in the next few years, growing from less than 500 billion yuan in 2012 and 2013 to a figure in excess of 3 trillion yuan by 201750. As the rates of internet access amongst EM consumers continues to improve, the possibilities for e-commerce will escalate. One study found that between 2013 and 2014 the number of Indian respondents who had used the internet for shopping in the past year had increased from 20% to 32%, and between 2010 and 2014 the number of people with internet access in India more than doubled, a trend also visible in other EM countries such as Indonesia51. Several African markets, including Nigeria and Kenya, also have well-developed e-commerce markets. In addition to transforming national and domestic retail markets, e-commerce could have an equally profound impact on international trade. Several e-commerce platforms, from eBay to the Japanese firm Rakuten, have expanded their activities into multiple new markets. The Chinese e-commerce behemoth Alibaba has also expressed a desire to expand its global operations beyond its domestic market52. The potential of e-commerce extends beyond the consumer retail sector. As will be discussed in section 9 of this paper, for decades there has been an increasing ‘electronic’ role in international trade – especially with the development of instant communication technology – and courts have had to develop appropriate legal responses to the important developments in international trade which technological advance has caused. In addition to electronic communications, electronic trading documents have also had an impact on the way that trade is conducted, and continued innovations ensure that this will also be the case in the future. One such innovation is the introduction of electronic Bills of Lading. Using soft or electronic copies of trade and commercial documents as opposed to hard copy versions has a multitude of potential advantages. As well as reduced waste and delay, e-documents can diminish the risk of fraudulent documents being created and, by virtue of being accessible by multiple parties in their ‘original’ format, allow for the increased integration of systems and document storage along the whole supply chain. In the past, the increase in use of electronic Bills of Lading has been slow, as every party in the contractual chain must be a party to the same trading system. However, if applied to all documents routinely used in commerce – from trade finance documents to invoices to certificates of origin – the impact could be significant and could greatly improve efficiency at several stages of the typical international trade transaction. As technology improves and as ever more people around the world have access to the internet and the online commercial marketplace, the role of e-commerce will inevitable grow in size and importance. It appears that, increasingly, large commercial transactions will be conducted on an almost exclusively e-commerce basis, for instance from the negotiation and agreement of contracts by email to the conclusion of the transaction and the delivery of the goods under the agreement by the presentation of an electronic Bill of Lading. In this context, it will be increasingly important to develop international frameworks which facilitate the conduct of international trade, whether this is by means of designing integrated online trading platforms or by putting in place international agreements to regulate and govern the conduct of international trade by means of e-commerce. This will be further considered in the next chapter, which will consider the role of international agreements and conventions in the regulation of international trade and commerce. Does the court have the jurisdiction to hear and determine the dispute? If so, which state’s law must it apply to the dispute? Over the years, governments – often working under the auspices of transnational bodies – have developed a series of mechanisms through numerous treaties and agreements in order to resolve the issues raised by the interrelationship of the laws of different states. This has been particularly important in the context of international trade, by providing the foundations of an international system encompassing all commercial activity and by giving a degree of certainty to traders operating across multiple jurisdictions. Indeed, business has demanded these laws and regulations. In the context of the EU, the key agreements binding Member States are the recently-recast Brussels Regulation on the extent of Member State courts and the Rome I Regulation governing the commercial parties’ choice of law in their contracts. In addition, several of the most important areas of international trade and commerce are governed by further agreements including non-EU parties. For instance, in the shipping industry it is commonplace for parties to a contract for the carriage of goods by sea to agree to incorporate the Hague or the Hague-Visby Rules to govern the respective rights of the carrier and the shipper (irrespective of the country in which the parties are incorporated), whilst the safe construction and operation of merchant vessels is governed by an international convention known as SOLAS (which has been signed by 159 states). Recently, the United Nations (UN) has attempted to unify and update the international regulations concerning the carriage of goods by sea in the Rotterdam Rules, signed by 25 countries55. Parallel to these maritime codes, a separate set of regulations – the Montréal Convention – covers the carriage of cargo by air. Ultimately, the purpose of these unified rules and conventions is to facilitate international trade by making its underlying contracts and regulations clearer and more efficient. Overseeing this regulatory framework is a collection of UN-mandated international bodies which create the rules themselves, as well ensuring their adoption and implementation. Prominent amongst these are the International Maritime Organisation (IMO) and UNCITRAL, the body dedicated to the harmonisation and modernisation of international trade and commercial law. Other bodies include the Comité International Maritime (CIM) and International Chamber of Commerce (ICC) which publishes the widely-used Incoterms. All these organisations can provide sets of rules and regulations – but the laws need to be enacted into contract and national law for them to become effective, and they need to be applied uniformly in all jurisdictions. This latter aspect remains a real issue for certainty in international trade. For centuries, London has been one of, if not the main centre of international trade and commerce. Whilst already a trading hub in the years following its establishment by the Romans, its central role in global trade began with the expansion of world trade in the sixteenth and seventeenth centuries, which in England prompted the foundation of the first joint stock companies. Principal amongst these were the Muscovy Company, the East India Company and the Hudson Bay Company, each specifically formed as a vehicle for the promotion of international trade and each trading goods across the world. At the same time, the emergence of modern banking practices was beginning, as was the case elsewhere in Europe. As a counterweight to the increasing innovation and risk undertaken by merchants in the City of London, the institutions underpinning its commercial stability began to emerge. In 1694, the Bank of England was founded, subsequently becoming a model for all central banks. A few years earlier the modern marine insurance market, to this day a vital component of modern trade, was born at Lloyd’s of London. Over the course of the eighteenth and nineteenth centuries, Lloyd’s became the foremost name in global marine insurance, its expansion driven in particular by the growth of European trade and by the losses suffered during a series of lengthy and destructive worldwide conflicts waged between the great European powers, including the Seven Years’ War, the American War of Independence and later the Napoleonic Wars. Lloyd’s was originally a coffee house where commercial and political information were exchanged. At around the same time, another coffee house – Jonathan’s – became the place where the City of London merchants would come to post the prices of stocks and commodities. It was the first example in the world of a systematic securities exchange and is the direct predecessor of the modern London Stock Exchange. Along with the emergence of Lloyd’s, it demonstrates the increasingly sophisticated and ‘modern’ practices emerging in London from the late 1680s onwards. Against this background, during the nineteenth century London became the undisputed centre of the global financial and commercial system. The accumulation of centuries of commercial expertise, added to the rapid growth of Great Britain’s mercantile empire and the advances of the Industrial Revolution, turned the City of London into a dominant force in international banking, commercial credit, share dealing, insurance and trade. And despite the political and financial turbulence of the twentieth century, London has managed to retain its status as a global financial centre of the first rank. The City’s tradition of blending history and innovation has been central to this and is well-illustrated by Lloyd’s which, despite its pre-eminence in marine insurance, continued to break new ground and create new markets with the writing of, amongst other things, the first American reinsurance policy and the first policies written to cover travel by motor cars and by aeroplane. Later, the London insurance market was also at the forefront of the creation of policies covering space satellite and cyber risks. Alongside this history of trade and commerce, English law has emerged as a pre-eminent legal system used in international trade contracts. It is, for example frequently used in coal, iron ore, agricultural commodities, oil, gas and shipping contracts. In part, the global importance of English law is a legacy of history, with many countries retaining legal systems derived from English common law. However, it is also underpinned by the sustained efforts of the UK Government to market London as a centre for international dispute resolution and commercial litigation56. Already, over 90% of commercial arbitration cases handled by London law firms involve an international party57 and two-thirds of litigants in the English commercial courts come from overseas58. As will be discussed below, English law has developed in tandem with trading and commercial practices and the English courts have historically been sensitive to the needs of parties engaged in international business. Consequently, English law is the most popular choice of law amongst international business people – one survey found that amongst general counsel and legal department heads across the world, 40% conducted most of their business using English law, making it almost twice as popular as the next most-used law (American law, cited by 22%)59. Unlike in many civil jurisdictions which place multiple restrictions on the kind of contract terms which parties can agree upon, English law gives parties wide freedom to contract as they please, making it ideal for parties who wish to tailor their agreements to suit their needs. Even where parties choose for their disputes to be heard in a non-English forum, they still often elect for the governing law to be English – for instance, 32% of the arbitrations heard at the Singapore International Arbitration Centre concern English law60. The English judicial system also compares well against many other jurisdictions in terms of its levels of professional expertise and the fees it charges to file and maintain litigation. A study by the Centre for Commercial Law Studies at Queen Mary, University of London found that the English Commercial Court enjoyed a clear competitive advantage against competitor jurisdictions – including the courts of Singapore and Australia, as well as newer forums like the Dubai International Financial Centre – when evaluated as a forum for the conduct of commercial litigation61. Whilst equivalent to many of the leading global commercial litigation forums in terms of the logistical support and technological services available to litigants, the English Commercial Court stands out against jurisdictions like Dubai, Singapore and Australia in terms of the comparatively low level of fees charged (especially in disputes which culminate in lengthy trials, as no daily hearing fee is levied) and in terms of the degree of specialisation of the judges who hear disputes62. Accounting for 1.5% of UK GDP, the legal sector is a significant contributor to the British economy and as such it will continue to be an important strategic objective for future UK governments that English law remains attractive to international parties63. Why has English law traditionally been provided for in international trade contracts? Certainty and consistency are of the utmost importance to the English courts’ application of the law. In contrast to many countries which use a civil law structure, the English common law system means that the courts are bound by centuries of binding precedent. English judges have much less ability than their civil law counterparts to interpret the law according to their idiosyncrasies, with the consequence that an English court is less likely to deliver a surprising or completely unexpected result. This means that when two parties are negotiating a contract they can have a great deal of confidence as to how it will be interpreted if a dispute arises later on. In addition, and as already mentioned, the restrictions on the clauses which parties are allowed to agree are much fewer in number than in other jurisdictions, giving parties the ability to structure their deals according to their particular needs. Whilst certainty and adherence to precedent are key facets of the English courts’ application of the law, this is not to say that they do not have the latitude to find novel solutions where this is clearly in accordance with commercial common sense. As a result of the early development of an advanced modern economy in the UK (as described above), the English courts have a long history of developing a legal framework well-designed to meet the needs and expectations of those engaged in trade and commerce. The English courts have consistently demonstrated that their approach to solving commercial disputes is underpinned by the desire to apply the principles of commercial common sense and to interpret the law in accordance with sound business principles. Central to this is flexibility and the capacity to adapt as business practice and technology evolves. This is a longstanding approach, illustrated by several nineteenth century examples. From early in the 1800s, the courts showed a willingness to imply terms into contracts which had not been expressly agreed between the parties in circumstances where it was obvious such terms were clearly understood by the parties to be part of their bargain (for instance, where such terms were customary in the particular type of contract or trade concerned64). Another well-known instance is that of The Moorcock65, in which it was held that a term will be implied into a contract if it is necessary to give business efficacy to that contract. Similarly, a more recent series of authorities has seen the courts having to deal with evolving technology and its use in the commercial world, such as the rise of instantaneous communications. In such cases, the courts have emphasised the need for a common sense approach, making explicit reference to the global commercial context in which litigants operate when passing judgment (prominently, in Entores LD. v Miles Far East Corporation66). This need arose as existing rules on the formation of contracts via postal communication became increasingly outdated in the context of international trade. In turn, the Entores decision was itself adapted and revised as the courts’ approach evolved along with commercial practice and expectations, for instance in The Brimnes67 and Brinkibon Ltd v Stahag Stahl und Stahlwarenhandelsgesellschaft GmbH68. This process continues in the present day. Several recent cases illustrate that the English courts will strive to give effect to the intentions of parties involved in commercial dealings and to take account of the sector- or industry-specific contexts in which they operate. Existing rules are not enforced inflexibly, and business common sense is allowed to prevail. This was the case in two recent decisions which considered the nature of offer and acceptance in crude oil trading. In both Proton Energy Group SA v Orlen Lietuva69 (in which HFW acted for the successful claimant) and Glencore Energy UK Ltd v Cirrus Oil Services Ltd70 the defendants attempted to evade their contractual obligations by claiming that their contracts, formed by an exchange of brief emails summarising only the key terms, had not been validly formed. In both cases the English Commercial Court disagreed, judging that on the basis of the parties’ past dealings and in the commercial context in which they were operating it was clear that they intended to enter into a binding agreement. Accordingly, one party could not later avoid its obligations on a ‘technicality’. The perils of being too dogmatic in the application of legal principles have also been addressed by the UK Supreme Court. In RTS Flexible Systems Ltd v Molkerei Alois Müller GmbH & Co KG (UK Production)71, the Court emphasised the importance of approaching disputes bearing in mind the notion of commercial common sense and with the aim of upholding the bargain which the parties involved originally intended to make. The English courts have repeatedly shown a willingness to update their approach and to ensure that the law is relevant to the needs and expectations of litigants. As trading practices and customs evolve, the law will adapt to reflect such evolution. As mentioned in chapter 7, one of the fundamental questions which arises in international trade is how to regulate relationships concerning parties from different countries conducting transactions across a range of jurisdictions. Each party to the transaction will be cautious about agreeing to the contract being governed by the law of the other party, or for disputes to be determined by the courts of the other party. A neutral law and dispute forum is usually required, but that neutral law and forum needs to provide certainty of performance to the parties about the rights and obligations set out in their agreement. In particular, it is important for parties to know which court to seek recourse in if a dispute arises, and whether that court’s judgment will be respected by other commercial parties and by other judicial systems in different jurisdictions. In the case of the courts of England and Wales, where the parties to a dispute are from the EU, the system for the recognition and enforcement of judgments is relatively well-developed and gives commercial parties a great deal of confidence that any judgment awarded in their favour will be recognised across the EU. In cases where a party incorporated in another EU state has either admitted that it owes money or does not defend a claim brought against it, the European Enforcement Order (EEO) is a straightforward way of enforcing a claim against that party. Where a claim has been defended, but judgment given in favour of the claimant, then the successful claimant can enforce its award under the Brussels Regulation (which also covers the jurisdiction of Member State courts). There are only limited grounds upon which a party can resist judgments made by a Member State court, meaning that there is a good chance that a judgment obtained in the English courts against another European party will be recognised and enforced. Similar provisions exist in the case of non-EU European countries (mainly, Switzerland and Norway) under the Lugano Convention. By contrast, where a party wishes to enforce an English judgment in a non-EU jurisdiction the situation is more varied and depends upon the UK’s bilateral relations with the state in which enforcement is sought. In the case of most common law jurisdictions (for example, Australia and all of the Canadian provinces except Québec) bilateral arrangements are in place to ensure the mutual recognition and enforcement of court judgments and that a party must follow the procedure laid down in the relevant agreement. Otherwise, enforcement of an English judgment will rely on the local laws in which enforcement is sought, or a combination of such laws and widely-recognised legal doctrines such as ‘comity’ (for instance, in most US states). This position is broadly similar in other jurisdictions around the world. Unless there is a trading bloc where agreement has been reached for the mutual recognition of judgments, for example, in the Gulf Cooperation Council (GCC) states, then a party will need to rely on a bilateral convention to enforce. Running parallel to the conventions and laws concerning the enforcement of court judgments is the New York Convention, which covers the recognition and enforcement of arbitral awards. Currently, 154 countries are party to this Convention, including all of the major world economies. This has made it a widely-implemented and successful instrument for parties wishing to enforce arbitral decisions made in their favour in countries where the counterparty to the arbitration agreement is domiciled or has assets. The New York Convention is one of the foremost examples of how international agreements can give effect to decisions made in their favour following a commercial dispute. Enforcement of judgments and awards does however remain an issue in many jurisdictions, and a common complaint of parties engaged in international trade is that when a contract goes wrong it is difficult to obtain recourse against a recalcitrant party, often due to perceived (rightly or wrongly) protectionism in the state of the judgment debtor. A bilateral investment treaty (BIT) is an investment treaty made between two states. These treaties contain reciprocal undertakings for the promotion and protection of private investments made by nationals of the contracting states in each other’s territories. These agreements establish the terms and conditions under which nationals of one country invest in the other, including the rights and protections which are attached to their investments. BITs are an important part of international trade – as measured by the United Nations Conference on Trade and Development (UNCTAD), they form the vast majority of all ‘international investment agreements’ (89.4% in 201272, rising to 89.7% in 201373). BITs provide protection against nationalisation and expropriation of foreign assets and other actions by a contracting state that may undermine the economic interests of investors from the other contracting state. Whilst they are, in effect, ‘contracts between states’ it is private investors who are normally empowered to bring actions against contracting states who have impinged upon their rights (so, a private investor will sue the defaulting contracting state, and the action is not brought by the investor’s home state). Disputes are usually settled in an international arbitration forum such as the International Centre for Settlement of Investment Disputes (ICSID). As such, BITs provide qualifying investors with certain minimum protections in respect of their investments in a contracting state. This is aimed at encouraging foreign direct investment (FDI), particularly in countries where investors fear that there is a higher-than-usual possibility of nationalisation or expropriation of private enterprises by national governments or where they fear the potential for bias when legal challenges are launched against the actions of national governments. 2,902 BITs were in force across the world at the end of 2013. 30 new BITs were entered into during the course of that year74. The nations concluding the highest number of BITS were Kuwait (7), Turkey and the United Arab Emirates (4 each) and Japan, Mauritius and Tanzania (3 each)75. Recent high-profile examples of cases brought by aggrieved companies include claims made by Repsol against Argentina and by Rurelec Plc against Bolivia – in both instances following the nationalisation of companies in which Repsol and Rurelec had controlling stakes. Consequently, BITs offer potentially powerful protection to investors and are an important part of the law and regulation governing international trade. Future developments could include the conclusion of a USA-India BIT which has been subject to sporadic negotiation between the two countries’ governments since 2008. However, there are numerous outstanding areas of disagreement, including over the form of any investor-state dispute settlement (ISDS) provision – the same issue which has recently stalled progress on the EU-USA Transatlantic Trade and Investment Partnership (TTIP). There are also serious questions about the extent to which BITs have any appreciable affect on FDI flows. Certain countries (prominently, Brazil) are not a party to any BITs, yet still receive significant volumes of FDI; meanwhile, several countries who have signed BITs see negligible bilateral investment76. UNCTAD has also noted widespread international dissatisfaction with the way in which BITs operate and has noted the potential attraction of “systemic reform” to the global patchwork of BITs – particular grievances cited by governments are ISDS provisions, inconsistencies between different BITs (an issue exacerbated by ‘most favoured nation’ clauses) and their interaction with regional or supra-regional treaties and agreements77. Such regional and supra-regional agreements have also called into question the role of BITs in a global market increasingly covered by multi-lateral accords and treaties (including the EU, EEA, ASEAN, ECOWAS, CAFTA, COMESA). There are often multiple overlapping and parallel provisions and a large degree of inconsistency and contradiction between the terms of such multi-lateral treaties and the provisions of the BITs also entered into by signatory countries78. A particular concern is how to determine which treaty will take precedence when there is a direct contradiction between the provisions of two or more treaties. This can lead to uncertainty, and various potential approaches to solving the issue have been proposed, including homogenising existing BITs under a broader supra-national umbrella agreement, although the preferred approach is yet to be seen. These and other objections have recently led to many countries deciding unilaterally to cancel their BITs and disaffiliate from ICSID, a trend which has accelerated in the past decade. Between 2007 and 2012, Venezuela, Ecuador and Bolivia all cancelled their outstanding BITs and between 2012 and 2014 South Africa cancelled its numerous BITs with European countries. In July 2014, Indonesia also declared its intention to cancel the 60-plus BITs to which it was a party. In each of these cases, a primary objection to the BITs raised by the cancelling countries’ governments was that the terms of their BITs permitted private investors, typically from developed nations, to challenge or otherwise seek to hinder the policy of national governments (often of developing nations). In the case of Indonesia, it cancelled the BITs to which it was party following a well-publicised dispute with UK-incorporated Churchill Mining, whilst South Africa’s action was preceded by a claim brought by Italian investors. Accordingly, the future of BITs is to a degree uncertain, for reasons encapsulated by the head of Indonesia’s investment co-ordinating board Mahendra Siregar: “It’s important for investors to understand that emerging markets are going to have new aspirations with regard to development objectives”79. Where BITs are deemed to conflict with such objectives, EM governments will be increasingly unwilling to be bound by their provisions. Whether or not this will have a significant impact on FDI patterns or international trade remains to be seen. As noted, countries such as Brazil have not needed BITs in order to attract foreign investment and engage in global trade – notably, in commodities. In the case of Brazil, many of the key rights and protections guaranteed by BITs were implemented into national law from the 1990s onwards as a means of reassuring foreign investors – a course of action which South Africa has also followed as an alternative to maintaining its BITs. Moreover, the existence of regional and supra-regional agreements and treaties has the potential to offset or mitigate some of the consequences of a nation’s decision to cancel or withdraw from its BITs. In the case of Indonesia, for instance, it is still subject to the investment protection stipulations of ASEAN’s Comprehensive Investment Agreement which, although not offering protection as stringent as that available in most BITs, goes some way to meeting the concerns of investors and parties engaged in other kinds of commercial activity. Notwithstanding these considerations, BITs will continue to have a significant effect on the protections offered to international investors for several years to come. This is on account of the ‘sunset clauses’ which every BIT typically contains. Such clauses provide for the BIT’s provisions to continue operating for a set period of time after one of the states elects to terminate or not to renew it. By means of such clauses, states will continue for several years to be bound by the treaty obligations imposed by a BIT even once they have decided to bring it to an end. These clauses can be extremely beneficial to foreign investors, as notice to terminate a BIT can give them 10, 15 or even 20 years within which to react to the host state’s cancellation of the relevant BIT. The current state of international trade is one of flux. So far in 2015, to take a handful of examples, Chinese trade data has been weak whilst other developed economies have enjoyed sudden surges in the value of their exports on the back of their weakening currencies (notably, Japan and Germany). Commodity prices are depressed – the story in international trade since the start of 2015 has been the low price of crude oil. But this is not the only commodity to be affected by low prices, iron ore, copper, and coal are also at relatively low values. However, short-term fluctuations should not distort the longer-term outlook – even if this is subject to a series of unpredictable variables. Amongst developed economies the eurozone is a persistent source of concern and considerable uncertainty. Meanwhile, as covered in chapter 2, some of the major emerging economies are also slowing. Russia in particular is a source of serious concern and a multitude of factors, from the continuation of sanctions in the short-term to an EU-wide search for alternative non-Russian energy sources in the medium to long-term, could have a profound and lasting impact on international trade flows. In the case of China, if the economy settles into a ‘new normal’ of slower growth and lower consumption this could be the definitive end of the ‘commodities supercycle’, bringing to an end one of the defining trends in global commerce over the last decade-and-a-half. Set against these pessimistic considerations, as discussed in chapters 2 and 5, the expansion of trade between non-BRICS EMs is expected to grow at rapid rates, irrespective of whether trade growth between developed economies is sluggish. The inexorable economic expansion of China is anticipated to continue, and this will lead to strong growth in its exports. As seen in chapter 5, in the next two decades the foremost bilateral trade relationships will be very different to those which predominate today. Added to changes in the economies and countries which will grow in prominence, changes will also be evident in how international trade is conducted and in the structures underpinning it. In chapter 5, for instance, the emergence of the NSR across the Arctic and its implications for voyage durations was examined. In chapter 6, the huge potential of e-commerce was surveyed – as both consumers and business increasingly buy and sell using online services and platforms, this could transform the way in which international commerce is conducted. New trade patterns and trade routes are emerging, and legal systems need to develop to support this changing market dynamic. The international frameworks discussed in previous chapters could also undergo considerable alteration in the coming years. Following the renunciation of BITs by a series of EMs, their long-term future in many economies is far from certain. It remains to be seen where UNCTAD’s suggestion of reform will lead and how (or if) regional and supra-regional economic groupings approach the task of integrating their treaty obligations and agreements with the stipulations of the BITs entered into by their Member States. At the same time, whilst multiple governments are working towards increasing the number and extent of free trade agreements currently in force, several of these are under threat, including the proposed USA-EU TTIP agreement. Arguably, this runs contrary to the increased international harmonisation and integration which has been seen in recent years and the uniformity embodied in agreements such as the Hague-Visby Rules and the Montréal Convention. This has significant consequences for the current established legal systems which have existed so far to support the growth of the BRICS and the old economies of North America and Western Europe. The question for now is whether these legal systems will adapt, or whether new systems and arrangements will come into force, thereby replacing the previous arrangements. In some circles, the current established legal systems are seen as part of the old world order, and therefore should be changed for that reason alone. But if something works and provides support to business, why change it? A key issue is certainty and the confidence of the users. Will changing trade patterns which do not involve Europe or North America mean that US or English law is replaced by a different national law? If it is – that law will need to provide the same level of certainty and garner the same level of confidence in the business world as the confidence held in the law it replaces. In particular, it will need to allow a business person to understand the rights and obligations set out in a contract, and know that he can rely on the counterparty to perform. Another issue is the location of the forum where disputes can be resolved – will London, Paris, Geneva and New York lose their status as centres for the resolution of disputes? Why should a dispute be resolved in Paris where the parties in a dispute are from Nigeria and South Korea? Geographically, Dubai or Singapore might appear to be a more appropriate alternative. Does it indeed matter where disputes are resolved? A different issue is the role of states in moving away from protectionism and upholding the rule of law and certainty in contractual relationships. International trade relies on performance of contracts – if contracts are not upheld then there will be no trade. Law and legal systems hold parties to their bargains. But if states withdraw from BITs, or do not permit judgments to be enforced, or contracts to be upheld, then international trade will struggle to flourish. This is a key issue for the further development of international trade, as new trade routes and trade partners emerge over the coming years. Regardless of the way in which global trade trends do materialise, the law will have to adapt to accommodate the developments in trading parties’ practices and customs. Whilst international frameworks will certainly evolve under the aegis of groups including IMO, UNCITRAL, UNIDROIT and the EU, history shows that so too will laws and legal systems. PwC (2013), op. cit. ; BBC, op. cit. PwC, op. cit. ; BBC, op. cit. 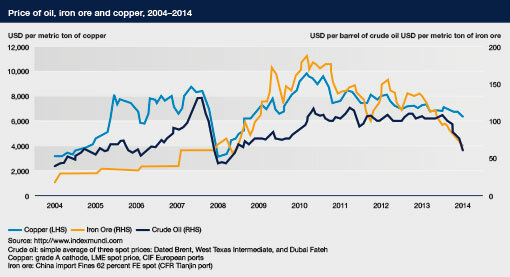 “Guest post: 10 consequences of the commodity crash”, The Financial Times (4 February 2015). The Economist, ‘Exorbitant privilege’ op. cit.